"We're very patriotic, even though we're undead." Look who I met while in line for the ferry! It started when I noticed the zombies in the car behind us, casually texting while waiting for the Kingston ferry. (Zombies of this un-age love to text.) I didn't know whether I should ask them about themselves, just ignore them, or what. Then I remembered that being creative means embracing my curiosity, and this sometimes requires being friendly - even to zombies. Also, I thought it was interesting how so many people just drove or walked by, ignoring them completely. 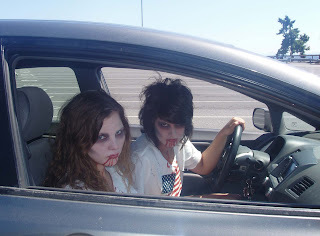 As for me and the zombies, I'm glad we got to chat. I learned that zombies just love taking the ferry. (Driving totally wipes them out.) They showed off their outfits for the camera, including the waist packs, always a favorite when you have a hard time grabbing onto things. 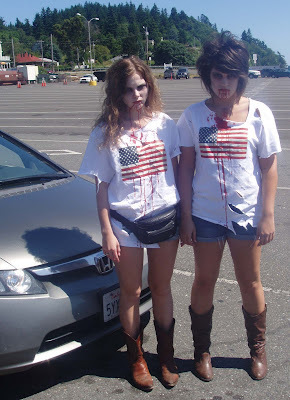 As well, they explained their matching flag t-shirts: "We're very patriotic, even though we're undead." Where is your curiosity leading? What questions might you ask, and who might you start talking to? Steve, thanks. It's true. Often when we're creatively blocked, we're trying to make ourselves interested in something we're really not interested in. Meanwhile, there might be something going in the shadows which will lead to discovery. Keep at it!